On a bright, warm morning in late July a surprise visitor arrived at a sub-basement classroom in 41 Cooper Square, home of the Albert Nerken School of Engineering. Joseph Herscher, looking a bit like a silent-era film comedian, with his thin frame, elevated hair and a bristle mustache, introduced himself to the assembled engineering interns as a "kinetic artist." (More on that later.) The interns, all from nearby high schools, were there as part of the Summer Research Internship Program. Mr. Herscher's appearance would bring art to science in a program, celebrating its 26th year, that continues to reflect the founding principles of The Cooper Union. The Summer Research Internship Program, started in 1987, annually gives a select group of New York City public high school students fully subsidized six-week crash courses in chemical, civil and mechanical engineering. "This year we had over 400 applications to fill forty seats," Prof. George Delagrammatikas, the Director of the program, says. "It's designed to give potential students a taste of the Cooper Union School of Engineering experience and let them decide if it's for them. But it focuses on under-represented groups in the field like women and minorities." The sponsors this year include Con Edison, the New York Building Foundation, The Manhattan Comprehensive Night & Day High School and the Albert Nerken School of Engineering. Students in each of four classrooms were nearing completion on work beyond the scope of ordinary high school sciences classes. 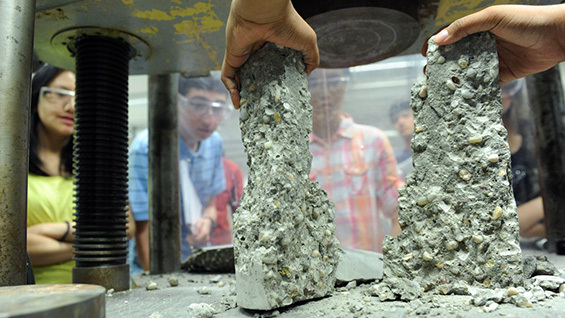 In the civil engineering class, Prof. Vito Guido's students watched as a column of concrete they had mixed days earlier had its maximum strength tested in a press until split into fragments with a bang. Behind them, on computer screens, sat designs for their two group projects focusing on storm-surge protection, inspired by the disaster of Hurricane Sandy on the local area coastline. One project proposed a storm proof causeway to connect the Rockaways with Sandy Hook, New Jersey. The other project proposed a system for sealing off tunnels, like the Holland Tunnel which closed after Sandy due to flooding, using pneumatic-activated doors. While Mr. Herscher, the kinetic artist, was downstairs, Prof. Ben Davis' chemical engineering class huddled in small groups at laboratory workstations. Beakers rested on heating pads while the students took careful measurements. 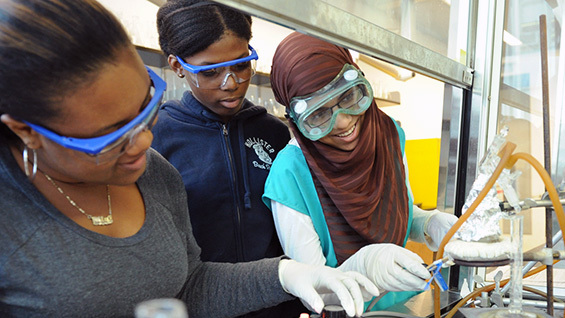 "We're distilling the wastewater that resulted from synthesizing nylon" Caroline Hunt a student at Achievement First Brooklyn High School, explained. "The nylon synthesis gives students a sense of the hidden environmental costs of everyday synthetics, Prof. Davis says, "for example you get a little bit of nylon and a lot of waste water." 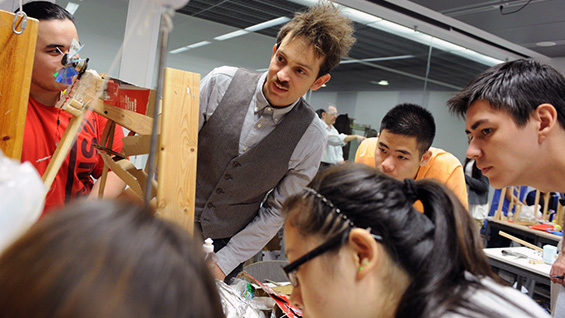 Like much of The Cooper Union's undergraduate pedagogy, the Summer Research program has an underlying theme of sustainability, perhaps none more so than Prof. Robert Dell's mechanical engineering class. Inside his Center for Innovation and Applied Technology classroom four different groups worked on ways of recapturing otherwise lost energy. One group took their device outside where they watched intently as a flexible Fresnel lens focused the sun's rays on the end of brass pipe, heating it to 140 degrees Celsius. "It works" one of them shouted as the water inside boiled, turned to steam and condensed into a measuring tube at the end. "At first we thought of using the idea to run a turbine," Alexander Grin of Staten Island Technical High School says, "but now we think it would be better used in a desalination process. It is easily scalable and could be put to use in places with a lot of sun, for example in Saharan Africa." Meanwhile, back in the sub-basement classroom Mr. Herscher, a native of New Zealand but lately out of Brooklyn, explained to Prof. Delagrammatikas' mechanical engineering class what he does as a kinetic artist. "I build Rube Goldberg machines that make a simple task as complicated as possible," he said. In fact, this was precisely what the students themselves were working on. Each of four groups had to get a ball from one corner of a 3' x 3' board to the opposite corner using recycled materials and as many steps as possible. 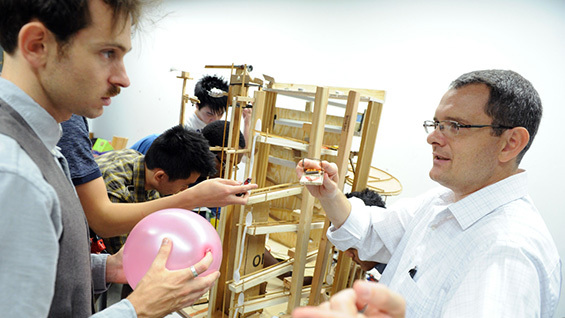 Though it may strike some as counter-intuitive to have an engineering class focus on making a simple problem more complicated, in doing so, "the students learn about devices important in the mechanical engineering field like pulleys, bridges, levers, motors, electrical switches and circuits while solving problems and working closely in teams," Prof. Delagrammatikas says. Mr. Herscher, who has built an elaborate machine to water a potted plant at the 2011 Venice Biennial and whose video of a device to turn a newspaper page has gotten over seven million views on YouTube, had arrived to offer his advice. His appearance introduced an interdisciplinary aspect into the class. "This is a step to go from S.T.E.M [Science, Technology, Engineering and Math] coursework to something being called S.T.E.A.M., where the A is for 'art.' " Prof. Delagrammatikas said. He visited each of four machines that had golf balls being carried up cardboard elevators, pulled in paper boats, zipping down ramps, strings being burned by candles, and mousetraps wreaking havoc. By the end the kinetic artist had learned a thing or two himself. "I loved the tracks that are made of up two steel rods, and as the steel ball rolled over them it completed a circuit and turned on a motor," Mr. Herscher said. "There were lots of cool ideas. The kids were very focused on what they were doing, which I was very impressed by because it is a very important skill for this kind of work. For the 26th consecutive year the Summer Research Internship Program has given local high school students a taste of the Cooper Union experience. "The program gives access to diverse groups of students who may not know of the possibilities of an engineering degree," Prof. Delagrammatikas says. "The very close interaction between faculty and the students in a highly collaborative environment allow them to learn things that are innovative and creative." According to the last longitudinal study, over 90% of students who participate in the Summer Research Internship Program go on to higher education and 70% pursue degrees in engineering. Ten percent like the experience enough to apply and be accepted at The Cooper Union. "I enjoy it," Mia Rodie of Francis Lewis High School in Fresh Meadows, Queens says of her time in the program, "even though it's harder than the Regents test."